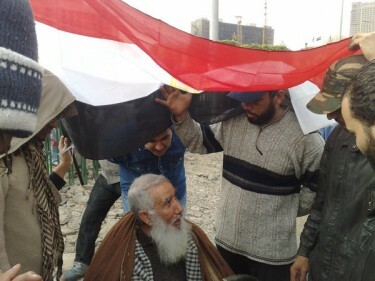 Egyptian Nadia El Awady last night tweeted that she needed a wheelchair to take her 73-year-old father to Tahrir today, where a Coptic mass is taking place as part of the Sunday of Martyrs. True to her word, with father in hand, Nadia shares with us her day in a series of tweets, from the heart of down town Cairo, and the epicentre of massive protests calling upon Egyptian president Hosni Mubarak to leave. Although she didn't find a wheelchair, Nadia and her father took a taxi to the Square, and made their way on foot to join the crowds. In Tahrir, as the mass begins, Nadia tells us how Muslims and Copts were joining hands,and chanting for a new dawn to begin in their country. Nadia also shares the suffering some of the Copts endured in the clashes with government-paid thugs and the security forces during the bloody days of the protests. Nadia and all the brave souls in Egypt! You have inspired millions throughout the world. You are not only liberating your country, but are contributing to the liberation of people throughout the world. I am an American, a Christian, and I want you to know that there are millions of us here in the USA that are praying for all of you and putting pressure on our congressmen, senators and president on your behalf. We live in interesting times. You Shall Overcome. God is Great!